This option agreement is for a situation where the ultimate sale price is not known in advance but is calculated after the event. For example, the buyer of the option wants to attempt to obtain planning permission. The seller wants a fair price - he does not want to see the buyer walk away with too large a share of “his” land value. The price paid to the seller is calculated as a proportion of the increased value. The proportion is a matter for negotiation, reflecting the difficulty of raising the value and the risks and cost to the buyer in time and money. The agreement provides for the option holder's task to be specified. It could relate to the grant of planning permission, the award of a licence, the outcome of an election, or a geological report. An alternative agreement for this situation would be a conditional contract. For the option holder, the attraction of this agreement is that he can still choose to walk away even if the awaited condition is fulfilled. This document is likely to be used in situations where the outcome of the event for which the option buyer hopes is unknown, like a residential planning application involving negotiations and a gradual approach to a satisfactory outcome (or appeal). It maximises the seller’s opportunity to share the profit without putting the optioner at excessive risk of over-paying. If the outcome is specific, like an application for a waste disposal licence, then the ultimate value can also be calculated accurately, so the sale price can be specific. In that case the optioner would prefer an option to buy with extensions to the term or maybe a no frills comprehensive option to buy land and property. An option buyer might use this document to give a property seller an additional incentive to act in some way to achieve the higher value outcome, or a seller might use it to ensure he or she shares in the whole profit. This agreement can be used for securing an option on any type of land and/or buildings, and with a view to buying the property for any reason. 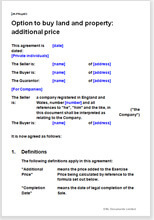 The document also includes an exercise letter template, which can be used by a buyer to exercise the option before the expiry date stated within the agreement. Property options are an area of law in which Net Lawman specialises. You can find our complete range of templates at: Property option agreements.